Home/Posts/Who are the pupils in alternative provision? Who are the pupils in alternative provision? Latest DfE statistics show that there were almost 16,000 pupils on-roll at pupil referral units, and another 22,000 in other local authority alternative provision in January 2017 [XLS, table 1b]. These are pupils whose education is paid for by the state but who do not have places at state-funded mainstream or special schools. Pupil referral units and local authority AP between them make up state-funded alternative provision. Pupil referral units include AP academies and AP free schools. Local authority alternative provision covers pupils for whom a local authority is paying full tuition fees and is made up of four categories: hospitals (as distinct from hospital schools); independent schools (including independent special schools and independent AP); non-maintained special schools; and not a school. So local authority AP provision, in broad terms, can be thought of more of as an alternative type of education to state-funded mainstream and special schools, whereas PRUs can be more typically thought of as somewhere a child might be forced to go to due to, for example, behavioural issues or having no school place. 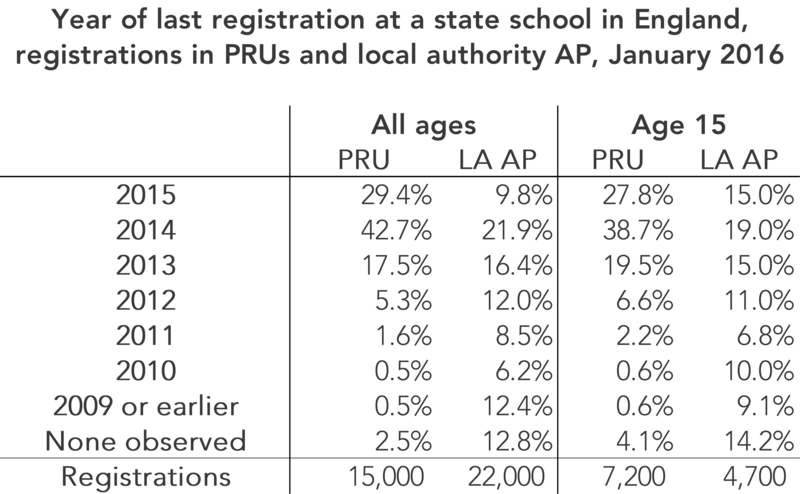 On top of that, there were another 10,000 pupils with subsidiary registrations at PRUs (i.e. pupils on the rolls of schools and attending a PRU for some of the time). While not alternative provision, we also need to keep in mind pupils in home education – estimated at more than 30,000 in a recent Schools Week investigation – some of whom may be there as an alternative to attending state-funded alternative AP. Data about children educated at home is not available, but we can look at pupils in PRUs and local authority AP. So who are they and how did they get there? 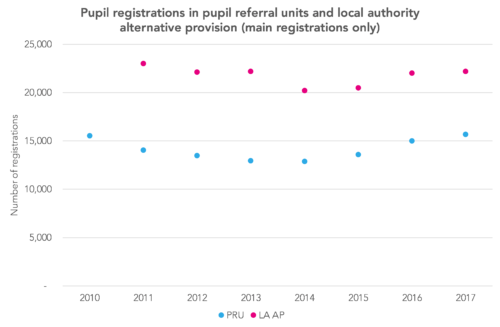 The number of pupils with sole or main registrations at PRUs has increased slightly over the last few years, having fallen between 2010 and 2014. This is despite the number of PRUs falling from 452 to 351 between 2010 and 2017. 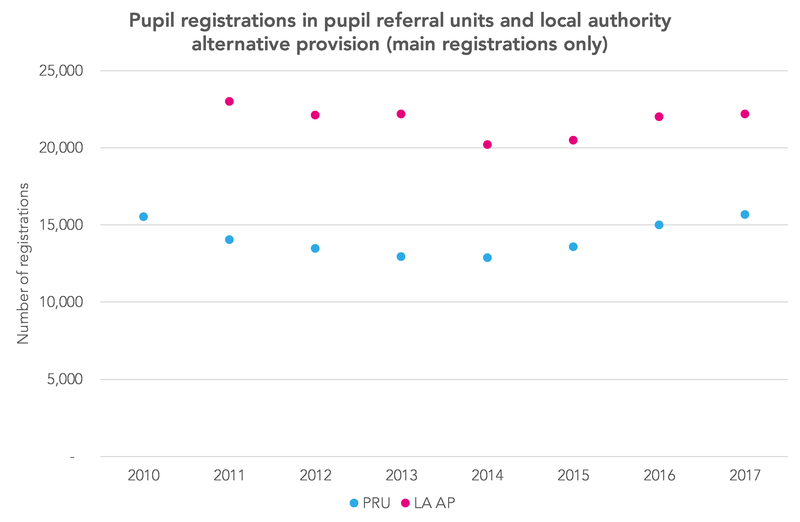 The number of pupils in local authority alternative provision has followed a similar(ish) pattern since records began in 2011. 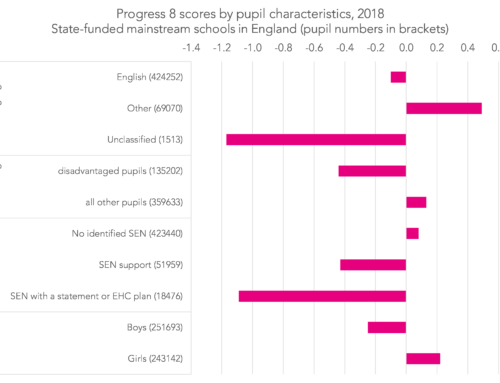 For the rest of this analysis, our focus will be the 2015/16 cohort of 36,600 pupils with sole or main registrations at PRUs or in local authority alternative provision. In total there were just over 37,000 registration records, indicating that some pupils were included in the PRU and/or AP census returns of more than one PRU or local authority. Excluding those with subsidiary registrations, around 700 of these pupils were also found to be on-roll at state schools. Most of this won’t come as a surprise to readers but it bears repeating nonetheless. Firstly, the chart below shows that pupils in PRUs and local authority AP shows were more likely to be secondary age. 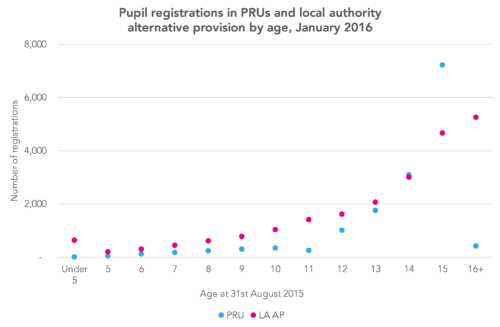 Nearly half – 48% – of pupils at PRUs were aged 15 at the start of the academic year (i.e. in Year 11) and another 20% aged 14. 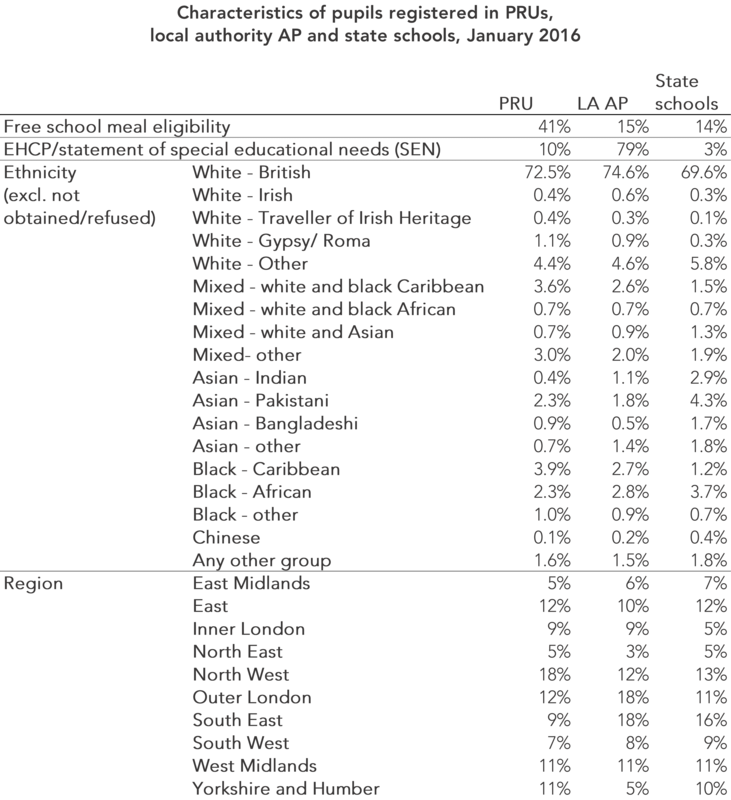 Secondly, the table below compares the populations of pupils attending PRUs and local authority AP with the general school population in terms of free school meal eligibility, special educational needs, ethnicity and region. 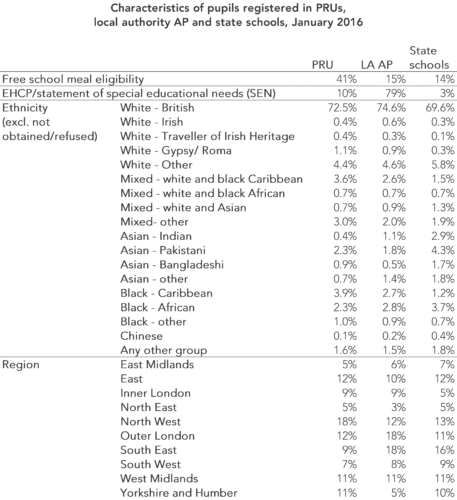 Given that the AP census is of pupils for whom local authorities are funding places it should come as no surprise that 80% have a SEN statement or EHCP plan. pupils in the North West and Inner London. pupils in Inner London and Outer London. When (if ever) were these pupils last registered at state schools (excluding subsidiary registrations)? 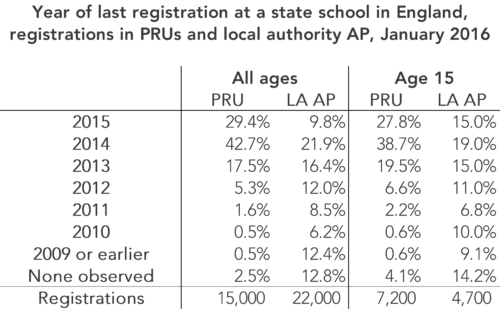 The table below shows that over 70% of pupils on roll in PRUs in January 2016 were last registered in a state school in 2014/15 or in autumn 2015/16. So most have been there a relatively short period of time. Local authority alternative provision tends to be longer term. Of those aged 15, at least 19%, and possibly as many as a third, had been in it continuously since 2010/11 or earlier, including 14% who were not observed to have ever been on roll at a state school in England. Finally, it is worth looking at the percentage to have been permanently excluded at any point up to the end of 2015/16. Perhaps surprisingly, of those registered in a PRU, only 40% have been permanently excluded. Among pupils aged 15, this figure is even lower, at 32%. This suggest that a sizeable number of pupils end up completing their compulsory education in PRUs despite not having been excluded. There are reasons to suspect that the data on permanent exclusions is not complete. As data is collected two terms in arrears, schools that close (including schools that make way for sponsored academies) do not supply exclusions data for their final two terms [PDF]. In addition, the government is clearly aware of under-reporting up to and including 2009/10 [PDF]. However, we estimate that under-reporting shortfalls as a result of the first of these issues will typically only be in the region of 100 to 150 permanent exclusions per academic year (recently, at least). 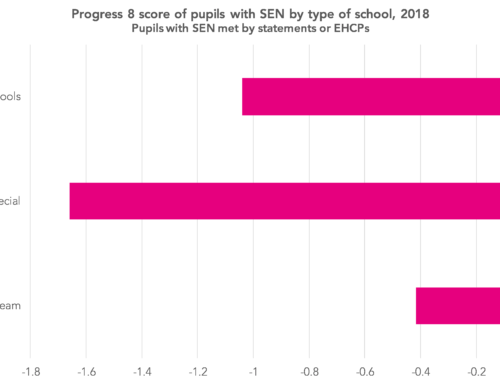 Therefore, it would appear that pupils in PRUs are arriving there, especially in Year 11, via other routes, such as managed moves – a point also raised recently in a report from The Difference. The data can only take us so far, however. We do not know the circumstances by which pupils have ended up completing their secondary education in PRUs. If it is the case that it as a result of a managed move then have they suffered a de facto permanent exclusion – with the true number of permanent exclusions under-reported? 1. Managed moves are a type of school move agreed between the establishments involved and parents. If a school had its own PRU, could they not move students between the main school and the PRU just before sensus in January?